“It wasn’t won here [in Mexico], it was won through a lot of hard work through many races,” said now five-time World Champion Lewis Hamilton. We have taken a look at the biggest moments that have decided this year’s Championship battle and how they paved the way for the Brit to join Juan Manuel Fangio and Michael Schumacher as five-time World Champions. 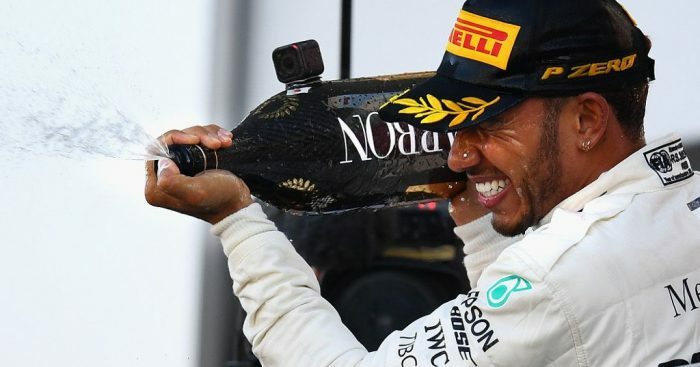 A software glitch in Australia, a gearbox penalty in Bahrain and the victim of a strategy error in China, it was a tough start to Hamilton’s title defence. Hamilton arrived in Baku with a nine-point deficit to Sebastian Vettel, with both Valtteri Bottas and Daniel Ricciardo within eight points of him. It got worse for the Brit as Vettel took pole position in Baku on the Saturday afternoon. However, his luck would change dramatically on the Sunday. The top five got away at the start without incident, but there was chaos further back. Kimi Raikkonen and Esteban Ocon made contact, while a huge shunt featuring Fernando Alonso, Sergey Sirotkin and Nico Hulkenberg brought out a first lap Safety Car. The front three then went away, with both Vettel and Hamilton pitting in the middle part of the race. Valtteri Bottas stayed out, and got lucky when a second Safety Car came into play. 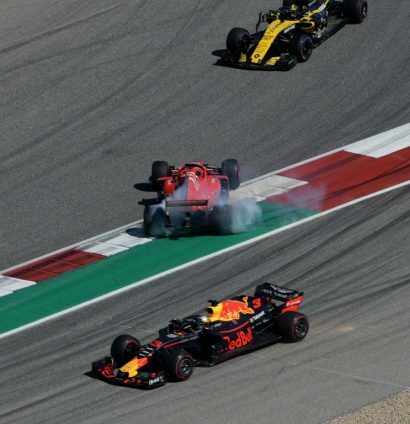 Then came the crash that had been on the cards since the SC restart, between Red Bull team-mates Daniel Ricciardo and Max Verstappen. Their big shunt down into Turn 1 scattered debris all over the track, and led to a second SC period in the final laps. This allowed Bottas to pit and rejoin in the lead, ahead of Vettel, Hamilton and Raikkonen, who had recovered back into the top four. At the second SC restart, there was only four laps left, and Vettel went for the big move. However, he locked up and ran wide, falling back down to P4. The next lap, Bottas suffered heartbreak as his left front tyre blew, causing him to retire from the lead of the race. Hamilton took the lead and went on to win the race, with Kimi Raikkonen finishing in P2. Vettel could not even manage a podium finish, as Sergio Perez got past the Ferrari man for third spot. Race 10 of the 2018 season was at Silverstone, Lewis’ home race, and the last part of the epic triple-header (after France and Austria). Sebastian Vettel came into the race with a one-point lead in the standings, off the back of Hamilton’s DNF in Spielberg. The Mercedes man qualified on pole in front of the home crowd, but got away terribly, allowing both Vettel and Bottas to get past. Raikkonen was alongside the Brit going into Turn 3, and made contact with Hamilton’s W09, spinning the Brit round. However, Hamilton then made his charge through the field, with the British crowd spurring him on, as Kimi was given a ten-second time penalty for the incident. When Marcus Ericsson crashed out of the race on Lap 32, the Safety Car was brought out, with both Ferraris and Red Bulls pitting for a second time. Meanwhile, both Mercedes stayed out to keep track position. Eventually, Bottas would lose the lead of the race on his worn tyres. 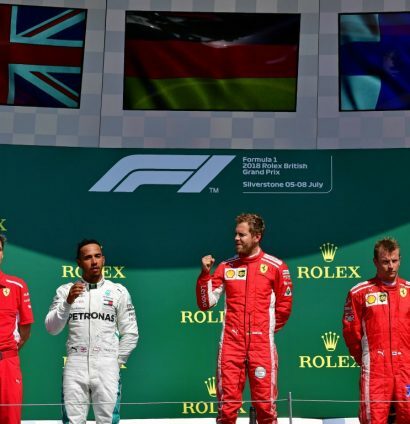 Vettel, Hamilton and Raikkonen got past the second Mercedes to finish in the podium positions, with Hamilton limiting the damage in defiant style by recovering from P18 to P2. It could have been so, so much worse for the Brit. Two weeks later, and the Championship race swung firmly in Hamilton’s favour. 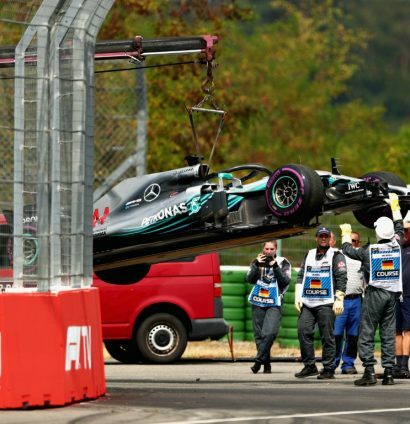 He came to Germany eight points behind the home favourite, Vettel, and Saturday was nothing short of a disaster. His Mercedes broke down in Q2 and meant he had to start the race from the depths of P14 whilst Vettel was seemingly sitting pretty on pole. The race was an eventful one at the Hockenheimring, Hamilton went long after starting near the back, going 43 laps on a set of softs before pitting. By this time, Vettel had been let through by Kimi Raikkonen and led his home race. However, the rain, Vettel’s nemesis, then started to fall. Max Verstappen chose to pit for inters, before coming back into the pits a few laps later for slicks. The rain then fell again. Hamilton had the best of the conditions on his new ultrasofts, which kept heat better than the softs that the rest of the front-runners were on. Vettel crashed out of the lead of his home grand prix, going straight on at the Sachs Curve, much to the dismay of the crowd, and himself. That itself, was without drama, though. The Brit looked like he was coming into the pits, but then returned to the track after passing the pit lane marker bollard. He was only reprimanded for the incident, and held off the Finns to take a dramatic victory at a drying Hockenheimring. After the summer break, and Sebastian Vettel’s dominant showing in Belgium, Hamilton led the German by just 17 points as the Formula 1 roadshow moved onto Monza. Neither of them would take pole in Italy, though, as Kimi Raikkonen set the record for the quickest average lap speed in Formula 1 history. His lap speed of 163.786mph broke Juan Pablo Montoya’s record from 2004, and also put a Ferrari on pole in front of the tifosi. Hamilton started from third on the grid behind Vettel, but went down the outside of the German into the second chicane, where everything changed. In trying to defend his position, Vettel made contact with Hamilton, and his Ferrari was spun round, falling to the back of the field in the process. He managed to battle his way back up the field to finish in P4, after Max Verstappen’s five second penalty saw him drop off the podium and into P5. Meanwhile, Lewis Hamilton made the overtake on Kimi Raikkonen after Mercedes set up the trap and added another 25 points to the bank. For Vettel, in front of the Ferrari faithful, had another race to forget. After another big win in Singapore, which included a quite frankly ridiculous pole position lap, Hamilton came to Russia with a 40-point lead in the Drivers’ Championship, the largest gap of the year to date. Once again, neither of the two title rivals would take pole position, as Valtteri Bottas put his Mercedes at the head of the grid in Sochi. Hamilton started P2, with Vettel in P3, and it stayed that way off the start, the Mercedes men teaming up down the long straight to keep the German at bay. The German pitted first, and when Hamilton exited the pit lane, he saw Vettel and Bottas just in front of him. However, just a lap later, the Brit was ahead of the Ferrari man and once again in the top four, as Max Verstappen and Kimi Raikkonen were yet to pit. On Lap 26, the dreaded call came from Mercedes to Valtteri Bottas, asking the Finn to move over and let Hamilton through to take P2. When Max Verstappen pitted later in the race, Hamilton strolled into the lead and went on to secure another race victory. Bottas finished in between the two four-time World Champions, meaning Hamilton gained a further ten points on his rival. Almost game over. 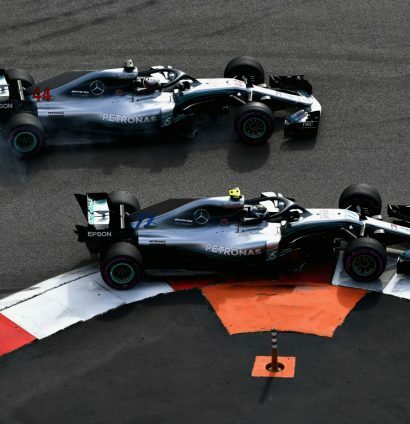 Although the title race was not mathematically decided at Japan or the USA, it was these two races that effectively handed the Championship to Hamilton. It was a terrible Saturday for Vettel at Suzuka, who could only manage to qualify in P9, but was moved up to P8 after the penalty given to Esteban Ocon. Meanwhile, Lewis Hamilton started from pole position in Japan, and would go on to win with race without any dramas. Further back, Vettel got away well and was immediately ahead of both Toro Rossos and behind Max Verstappen. However, the German attempted a move down the inside of the Red Bull man into Spoon corner, and found the door firmly shut by Verstappen. A risky move that did not need to be taken given the Dutchman’s impending penalty. This led to Vettel spinning round (again) and falling to the back of the field. He would eventually finish in P6 and more than a minute behind Hamilton. It would have felt more like a million miles away. The misery continued for Vettel in the USA, as he was given a three-place grid drop for failing to slow sufficiently for red flags in FP1. This meant that despite qualifying in second, he would have to start the race in P5, behind both Mercedes, his team-mate and Daniel Ricciardo’s Red Bull. No driver has ever won from the outside of the front row in Austin. Hamilton starting from pole made matters worse, but on race day, Kimi Raikkonen took the lead in the first corner. However, Sebastian Vettel spun again! Again! This time he went into the side of Daniel Ricciardo and his Ferrari pirouetted round. In Austin, he managed to recover to P4, while Hamilton’s two-stop strategy did not work and the Brit could only manage a P3 finish. Kimi Raikkonen took his first victory in 113 races, breaking the record for the longest gap between wins, but more importantly, it showed that Vettel would have had the pace to win the race if he was able to keep his nose clean. And so to Mexico, and Hamilton knowing that he only needed to finish inside the top seven to be crowned World Champion for a fifth time. After a dreadful Friday, in which even the Renaults were ahead of the Mercedes duo, Hamilton’s fortunes improved in qualifying on Saturday. The Brit managed to put his W09 on the second row of the grid, only behind the two Red Bulls by a tenth. He went on to finish a painful P4 in the race as Mercedes’ tyre troubles came to the fore once again, but Vettel’s strong performance in P2 was not enough to stop Hamilton from moving above him as a five-time World Champion. Fangio, Schumacher, Hamilton. The Brit is now up there with the ultimate elite class of Formula 1.